PRAYER PROMPT ••• I’m not going to write about yesterday’s school shooting. My position hasn’t changed since the last time there was an incomprehensible shooting: we have a serious heart problem in America and we need to return to God. Please pray though, not only for the victims but for the shooter too. So many lives affected and for what? It’s further proof that Satan is looking to destroy us. Much could be said about it, but instead, let’s discuss perseverance through discouragement. There are times when everything seems too hard. But let’s look at things from the perspective of a lighthouse. A couple of years ago, my husband and I went to the Outer Banks for our anniversary weekend. While we were there, we visited Cape Hatteras Lighthouse and decided to go to the top. Several times on the way up, I was ready to pull the plug on the idea. The stairs were tight and slippery. This was supposed to be a fun adventure for Wayne and me, but trudging up stairs that never seemed to end wasn’t fun. The wind off the ocean was better than an air conditioner. The pay off was worth the effort. 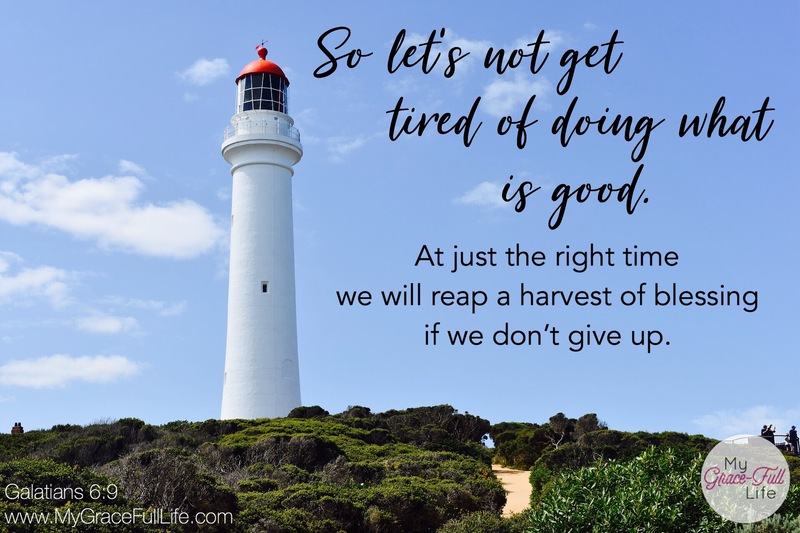 We find ourselves in situations where the effort hardly seems worth it. But we have the Holy Spirit to encourage us, even if we’re tempted to give up. If the Holy Spirit is guiding your heart then we can trust in God’s good plan (Jeremiah 29:11). Trust that God is in control. Today, as you pray, ask the Holy Spirit to encourage you when you feel like giving up. Ask Him to give you strength. And it’s okay to ask Him to carry you when you need to rest. Okay… no fair… you hit this one home… and God knew I needed it! Outstanding post, dear Denise! By the way, this is one of my all-time favorite verses. It was one of the first that I ever memorized. Thank you! ❤ and huge hugs! Previous Previous post: 2.14.18 Prayer Prompt: What is Happiness?